Jeremy is in the middle of creating a new program to reinforce the Skid’s protection! But as usual, he forgets to live a little. 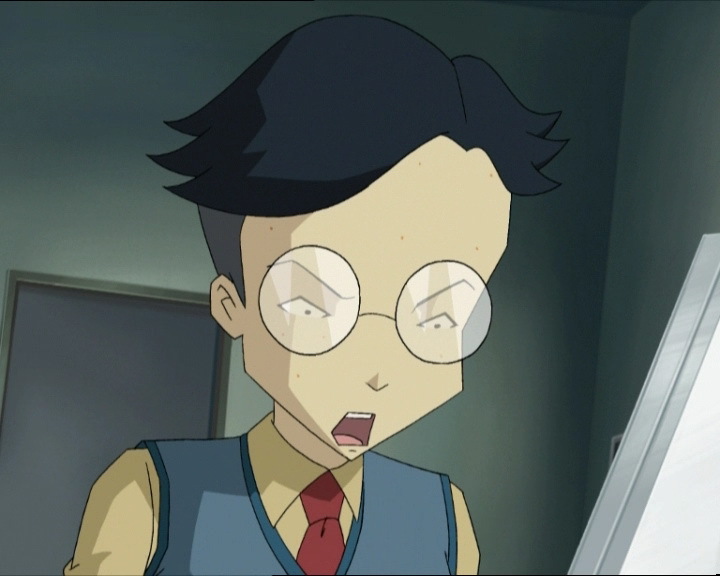 When his friends ask him to help out with a match of foosball between Ulrich and Odd against Aelita and Yumi, he bluntly refuses! And then, a nasty surprise awaits the hero! The principal arrives in Jeremy’s room to announce some important news! His cousin Patrick has arrived! His parents decided to enrol him at Kadic! Jeremy hates his cousin because he’s very sociable and often overshadowed him in their childhood! What’s worse, Patrick is already there and is going to stay in Jeremy’s room while he waits for one of his own! 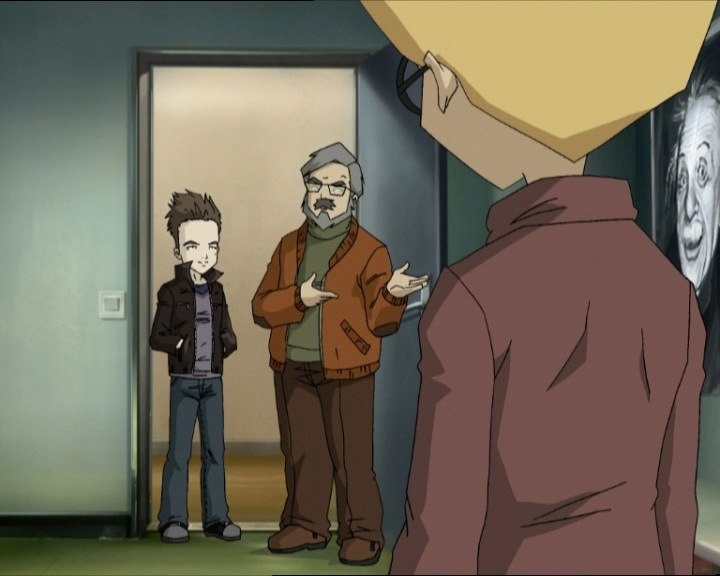 While Jeremy tries to make his cousin understand that he’s not welcome and that he needs to let him work in peace, the other Lyoko Warriors arrive! They first approach Jeremy about his not wanting to play foosball with them, then become surprised at the resemblance between Jeremy and Patrick. The brainiac then explains that Patrick is his cousin. To Jeremy’s disdain, Patrick appears to get along well with the heroes right off the bat! 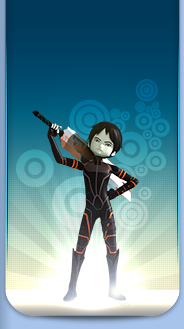 He plays the same video games as Odd and practises a martial art like Ulrich does: aikido! When the heroes seem to have already accepted Patrick, Jeremy becomes furious, refuses again to play with them, letting his friends understand that he’d rather work on his “project on the Vikings and their legendary Drakkar ship, the Skidbladnir.” Finally, he kicks everyone out of his room! Aelita goes back to talk to him and asks why he was so rude to Patrick. Jeremy explains that he and his cousin never got along and that he’s certain Patrick is trying to steal his friends! 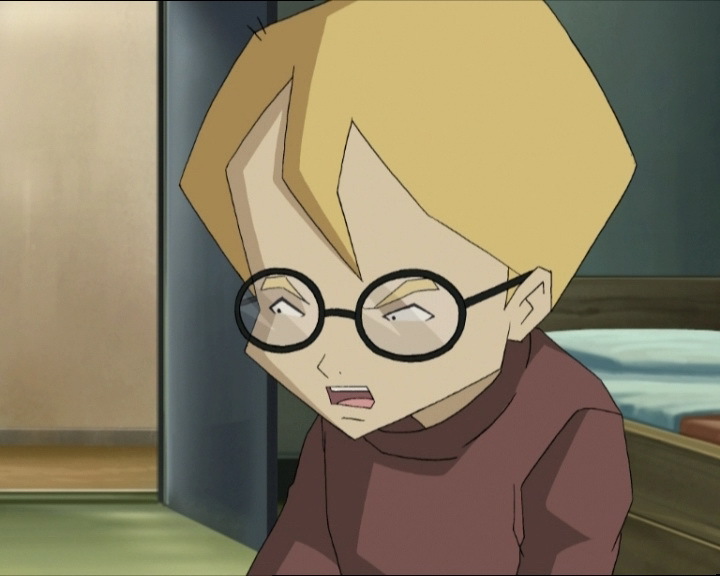 Aelita isn’t convinced, Jeremy gets annoyed and tries to make her understand! In the end she goes to join their friends and Patrick in the rec room! But then a beep is heard: the Superscan has detected a Replika! Jeremy leaves the program for the Skid’s shield to finish running! He grabs his laptop and leaves the room, making sure to lock the door. 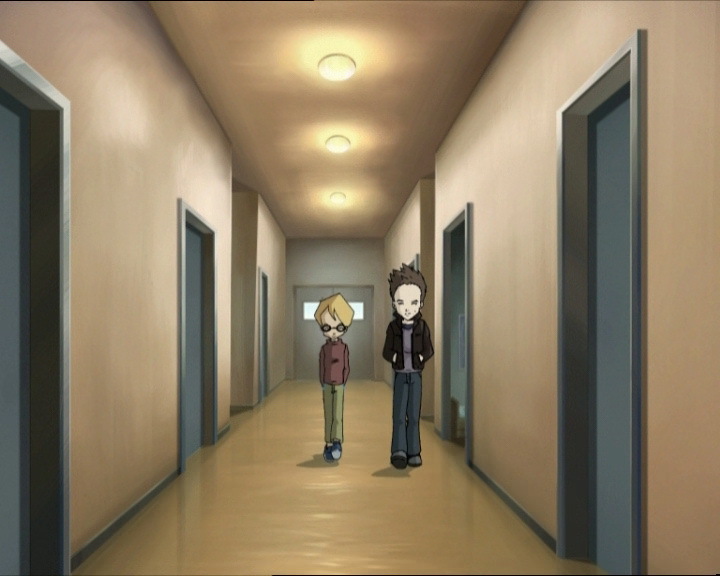 The heroes receive a call from Jeremy and lie to Patrick to get to the factory. Once there, they virtualise and set off for the Digital Sea! Meanwhile, Patrick gets into Jeremy’s room with a duplicate key given to him by the principal! Sissi takes advantage of this to accost him and try to make him understand that Jeremy is up to no good! Patrick doesn’t believe it but Sissi realises that she can find something to prove it on Jeremy’s computer. She calls Herb, still in the rec room, and orders him to come to her! In the Digital Sea, the Skid is about to reach the Replika when three Sharks appear! The Navskids are released and engage in a torpedo fight with XANA’s marine monsters! Panicked, Jeremy doesn’t waste time in realising that the program he left in his room has bugged up! He tries to get into the computer remotely but Herb locks him out! The situation worsens: XANA activates a tower in the Desert! Jeremy takes matters into his own hands: he gives ambitious objectives to the heroes! 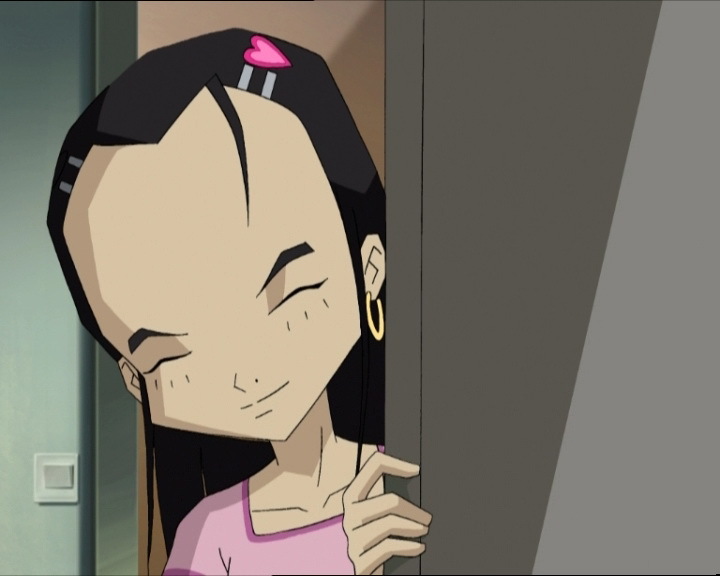 Find Aelita, get rid of the Sharks, return to Lyoko and deactivate the tower! Meanwhile, the brainiac sets up a firewall and leaves the factory to return to his room! Messing with Jeremy’s computer is definitely what made the Skid bug up! Sissi and Herb prepare to find the principal and have their enemies locked away forever! Patrick then intervenes! 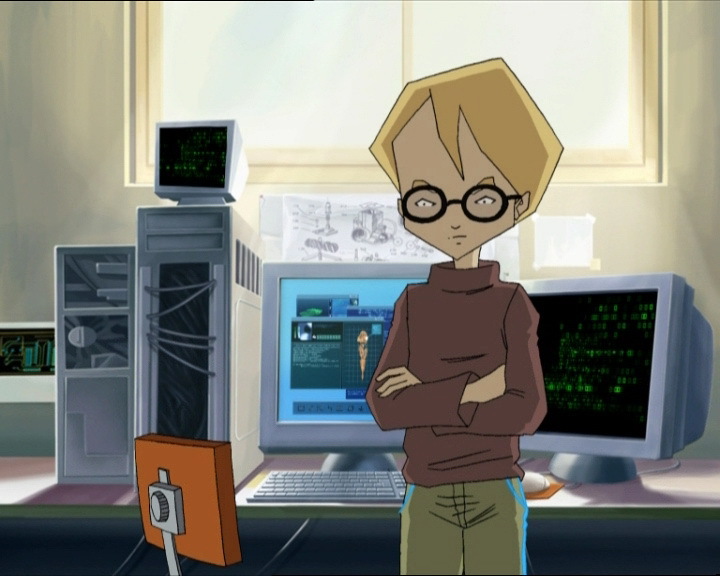 He throws Herb away from the controls and orders nobody to touch his cousin’s computer until he’s explained everything on it! Unfortunately, XANA takes action: Herb and Sissi are XANAfied! They throw Patrick into the hallway and Herb goes back to the controls, set on sabotaging the Navskids and the Skid! He strikes the firewall Jeremy put in place! Jeremy then arrives! Patrick explains the situation. Things couldn’t be worse: two Belpois can’t stand up to two XANAfied people! On the network, the situation is also getting worse! Even if the Sharks are being worked away at under the heroes’ torpedoes, Aelita is still drifting and is attacked by a new monster: the Squid! It grabs the Skid and attacks its windscreen with a large drill! This jackhammer monster puts Aelita in grave danger! At that same moment, Herb breaks through the firewall and renders our heroes’ Navskids no longer operational! Jeremy then has an idea worthy of…himself! If he cuts the power to Kadic, his computer will turn off and Herb will lose all access to the Skid! He runs through the hallways. Sissi realises what he’s planning and tries to catch him, but she is stopped by Patrick who holds her back long enough to allow Jeremy to reach the fuse box! The heroes can exterminate the last Sharks! The Skid’s shields return! The Squid doesn’t give up and tries to pierce them, without any success! Odd, Ulrich and Yumi then unite to blow it up with a triple torpedo attack! 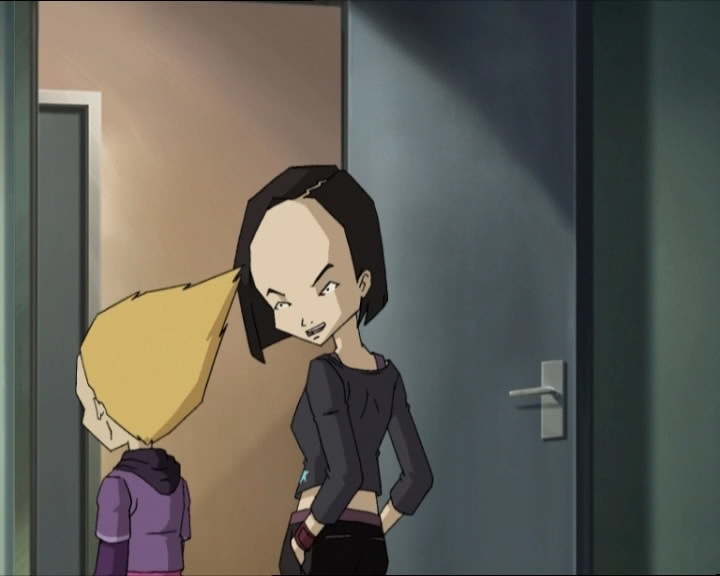 They re-join with the Skid and hurry to Lyoko! On Earth, the situation is far from stable! Annoyed at not having killed the heroes in the Digital Sea, Sissi attacks Jeremy! Herb waits for the electricity to be turned back on and decides to hack the Skid again! In the desert Sector the tower is guarded by two Tarantulas! 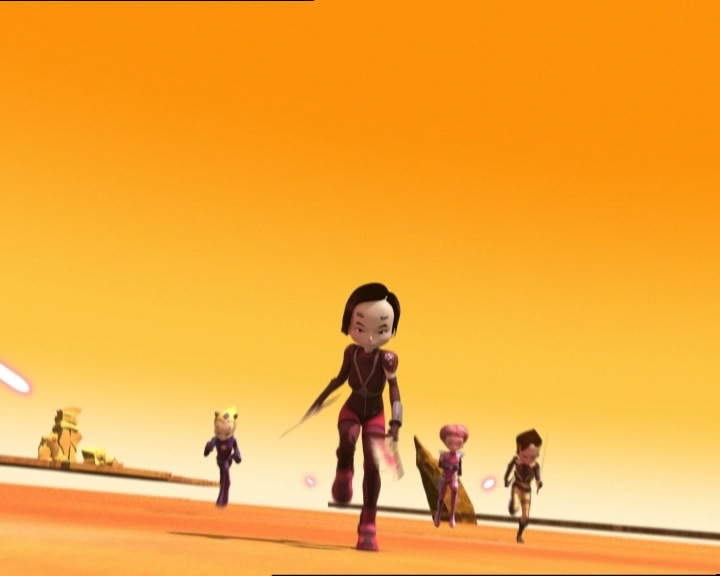 However the heroes launch a relentless assault, Aelita starting them off! Her determination is infallible: Jeremy is in danger! She destroys the first Tarantula with an energy field. The second devirtualises Yumi, but is itself destroyed by Ulrich, who jumps above it and stabs its eye! XANA soon sends two more Tarantulas, but Aelita makes it to the tower first and deactivates it, saving Jeremy from Sissi and the Skid from Herb! On Earth, Jeremy goes to find his cousin, badly hurt on the staircase where he tried to save his cousin from Sissi. Back in time, Jeremy warmly welcomes his cousin! Unfortunately, his parents have taken back their idea to enrol him at Kadic, opting for a school closer to them! Jeremy seems upset, but decides to have a game of foosball with his cousin before he leaves! - Attack: XANAfy Sissi and Herve to sabotage Jeremy's programs! - Only appearance of the Kalamar. This monster has no known official English name, but it can be translated as something like Squid or Oktopus. - Only appearance of Patrick, Jeremy's cousin. 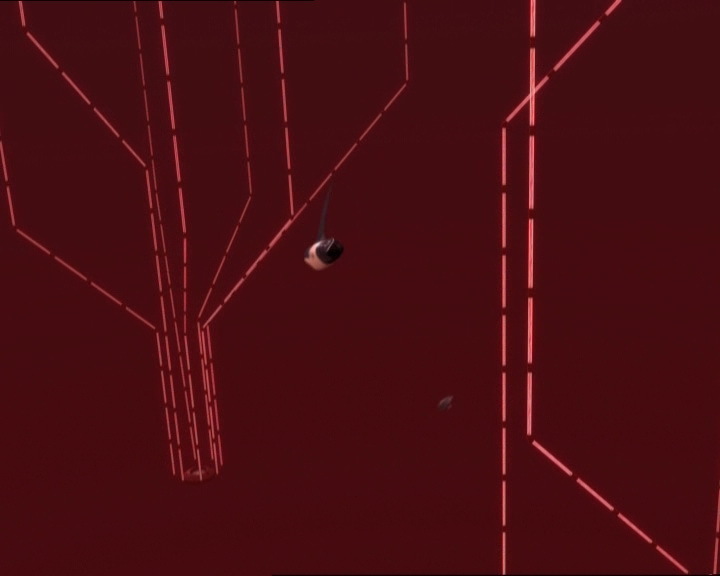 - Only time Aelita launches the return to the past. - Second season 4 episode in which William is absent. - Odd based his current Earth outfit on Kung Fu Commando. Patrick believes he must be stuck on level 7 because the clothes get a lot more tame on level 8. - Herve's hair is entirely black in one shot. 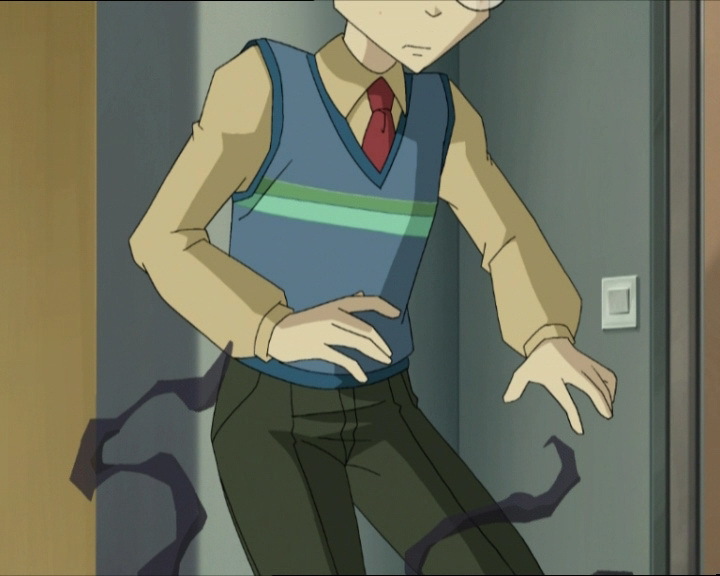 - The colour of Jeremy's door is dark grey instead of light grey. - The doors in the dorms are turquoise blue instead of grey in several shots. - At the moment when Sissi asks Patrick to get out of her way and when she grabs him, there's a heart on both her hair clips. - When Sissi and the others listen to the recording of the phone call Jeremy made to her in episode 80 “Dog Day Afternoon” posing as her father, the wording is not the same as in the original episode. - Final appearance of Sharks. - First mention of two games: Kung Fu Commando and The Dentist Steel Massacre. 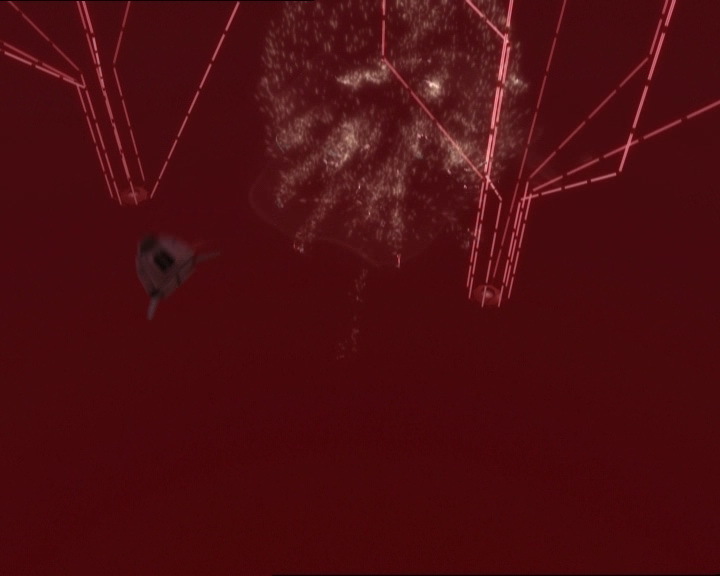 - Only time Ulrich fires a Navskid missile and destroys a wall in the Digital Sea. - Recordings of a couple of uses of Jeremy's voice manipulation program are heard, notably Jeremy a call to the principal in episode 67 “Double take” and one to Sissi in episode 80 “Dog Day Afternoon”. Having pins and needles is a somewhat unpleasant tingling sensation in a part of the body after not having moved it for a while. The tingling feels similar to being poked with pins or needles all over the area in question. - The TV series Sissi is a fan of is “Love, Glory and Paella,” based on “Love, Glory and Beauty” which is an American soap opera. Paella is a Spanish dish of rice, saffron, chicken and seafood. Odd (seeing Patrick): Incredible! Einstein’s made a handsomer clone of himself! Patrick: I’m not as bright as Jeremy, that’s for sure! Odd: You think he’s bright, do you? If you ask me, he wears kinda drab colours! Odd (about Jeremy): If he was my cousin, I’d ask for a divorce! Herb (watching TV, to Sissi): Can we change the channel? This is the third episode of Love, Glory and Paella in a row! Jim: Well then, Belpois, got a little family company? Oh, looks like you’d rather not talk about it. Happens to me sometimes too! Patrick: Who are XANA and Replika, a couple of Greek friends? Odd: Uhh haha…right! And they make a wicked moussaka, but you gotta eat it while it’s hot! Sissi: I don’t care, you little dork! Odd (about the Sharks): Just one for each of us? Piece of cake! And I’m the expert at desserts! Patrick: Wait! 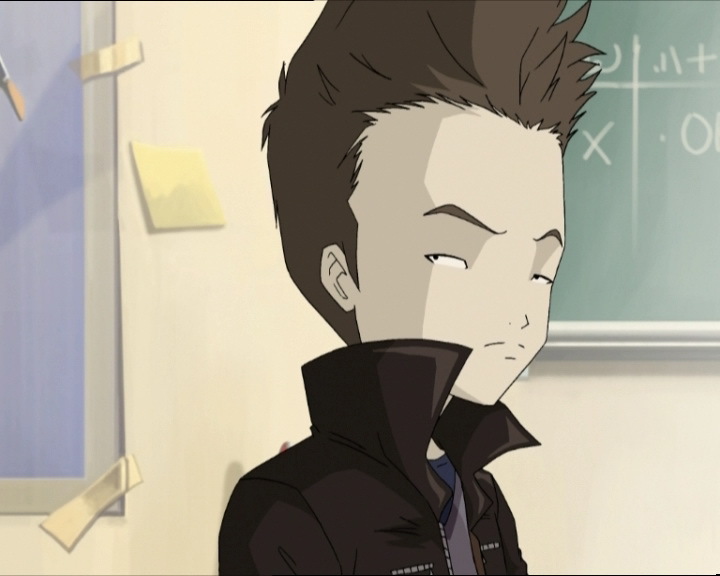 I’m sure that’s Aelita’s real ID file, he must’ve scanned them for the photo, he’s got a crush on her, right? Herb: Yeah, and her health records? Did he scan those to get her eye colour? Odd: You want us to turn a squadron of deadly Sharks into fish sticks, find the Skid and haul it back with our tiny little reactors? Jeremy: That…pretty much sums it up! Odd: Ok, we’re on it, Einstein! Odd (noticing the Squid): What have we got now?! It looks like a monster from The Dentist Steel Massacre! Yumi: Yeah, except this one looks worse! Odd (in a bad way): To think I’ll never get to level eight of Kung-Fu Commando… Patrick’s such a lucky guy! Odd: Ah! That’s much better, I had virtual pins and needles in my legs!